A nicely lit and decorated space with the finest crockery and modern appliances sitting on the shelves; that’s how you define a stylish kitchen. These days the idea of interior decoration is not just limited to beautifying the bedrooms or lounges, infact pepping up the look of a kitchen is something which people are readily opting for. Kitchen backsplashes are what we’re referring to here. In the old times, backsplashes were used in bathrooms and kitchen to protect the walls from the splashes of water. Today, they’re a style statement used for revving up the look and ambiance of a kitchen. Constructed out of tiles, glass etc, the backsplashes have brought about a commotion in the realm of interior designing. If you’ve been planning to revamp the look of your kitchen with a smart and elegant kitchen backsplash, here are some brilliant ideas from which you can take inspiration. Adding a mint colored tiled backsplash is an excellent idea of decorating a kitchen. 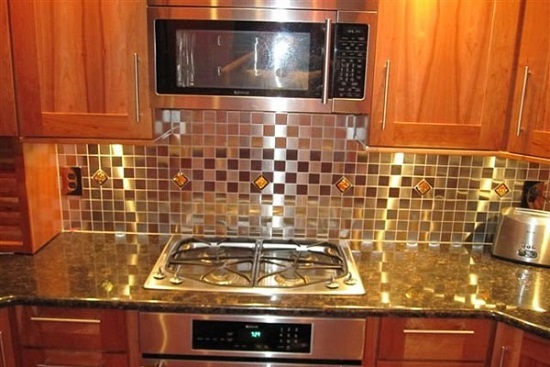 There are limitless options available in the styles of backsplashes these days. 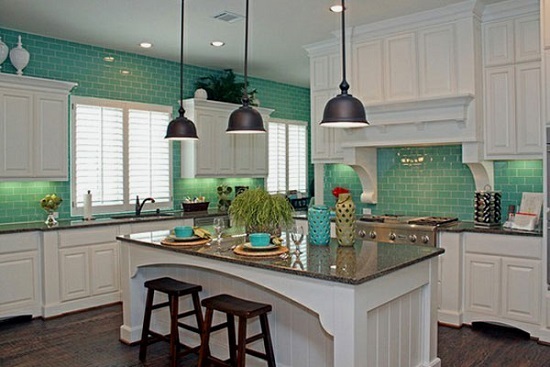 If you’re planning up on picking some kitchen backsplash tiles, mint is the color you should opt for. Use it in combination with white or beige tiles and you’ll find yourself standing in the middle of a soothing and elegant kitchen. This one is a budget friendly backsplash idea that you can choose. Buying a similar set of tiles or other backsplashes might cost you slightly more than this one. How? Well, this is because when it comes to abstract you can just combine anything and everything to come up with a pattern of your own. Setting up a kitchen all draped with a wooden pattern is the classiest thing to do. You’ll find a multitude of ceramic tiles that feature wooden prints in the market these days. 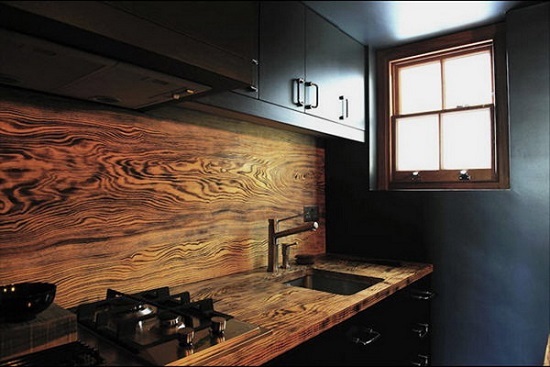 Combine it with cabinets of a dark shade and you’ll find a traditional yet stylish kitchen for yourself. Mosaic tiles are rage these days, whether we talk of a kitchen or a bedroom. 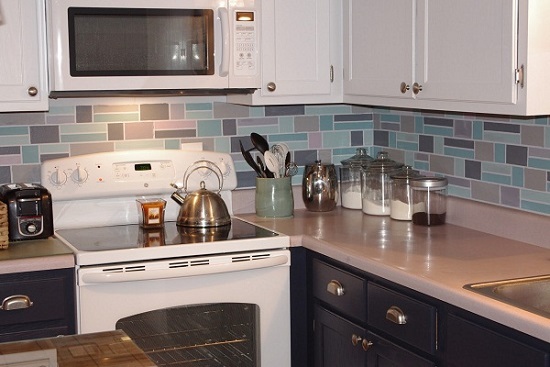 Lighter shades of blue mosaic tiles can be used as a kitchen backsplash. Using these in combination with white cabinets can really help you give your kitchen a wonderful look. Modish and innovative, sleek look is what is the talk of the town when it comes to decorating the interiors. 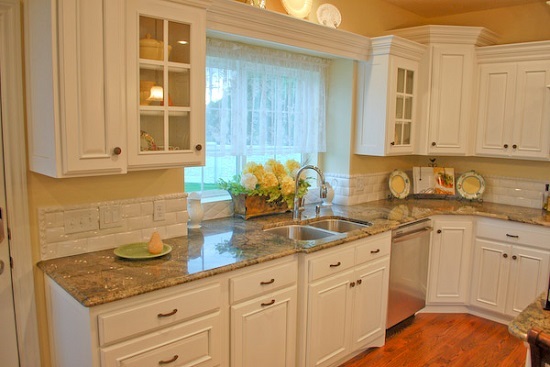 Use grey and white granite tiles to add a dash of elegance to your kitchen. Using it in sync with silver and white will beautify the look of the kitchen even more. 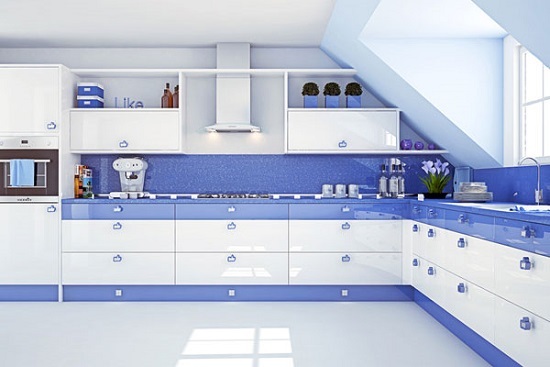 Shades of blue can really help you to add a extra amount of coolness to the kitchen. When combined with white floor tiles and cabinets, this will make a superb idea of a backsplash for your kitchen. 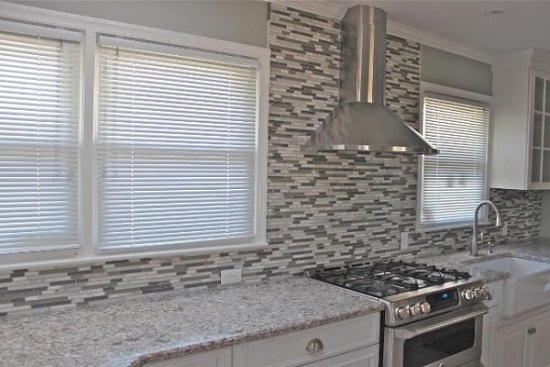 Tiles with a metallic sheen are a great option to use as a kitchen backsplash. Whether you use white or wooden cabinets with it, you’ll find a brilliant kitchen space. 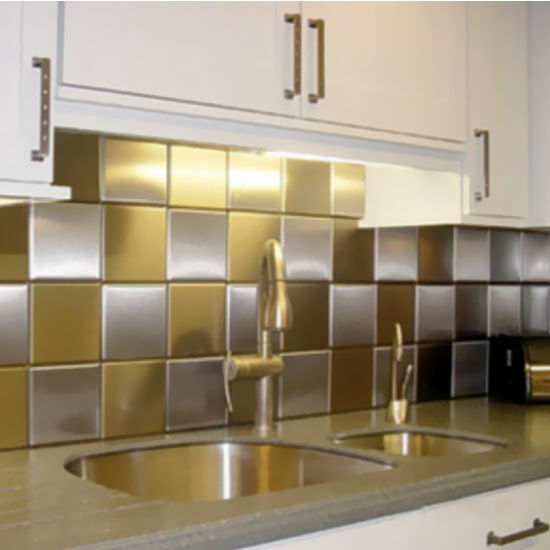 Metallic backsplash comes in different shades like bronze and silver. These are perfect for huge kitchens. 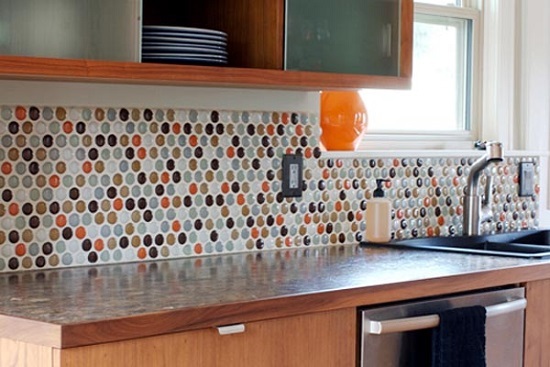 Cute and quirky, using white tiles with multicolored polka dots will make your kitchen look neat and stylish. This will add a dash of color to your interiors in the minimal manner. You can use subtle shades of cabinets to give your kitchen a sweet yet unique look. 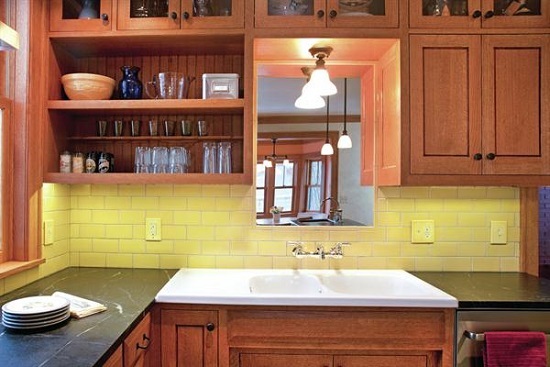 Combining yellow and wooden tiles together will create an immense amount of style in your kitchen. For giving a sun-kissed look to your kitchen, use pastel shades of yellow like lime, sunlight yellow etc. 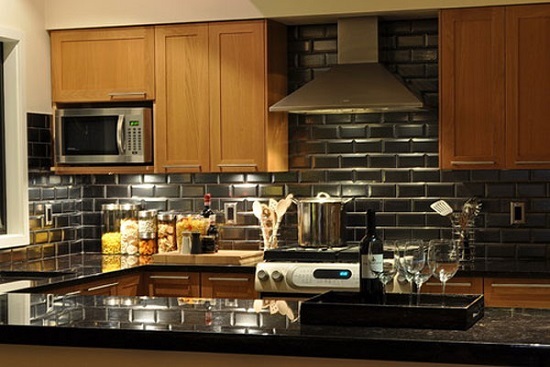 Strike a chord by decorating your kitchen with a backsplash made out of a gold-colored metallic tile. You can use it in combination with white or black to bring out the elegant side of the interior. Murals are creative artworks which are quite a rage these days when it comes to decorating ones interiors. Initially used for bedrooms and living area, murals have now found their way into the kitchens as well. 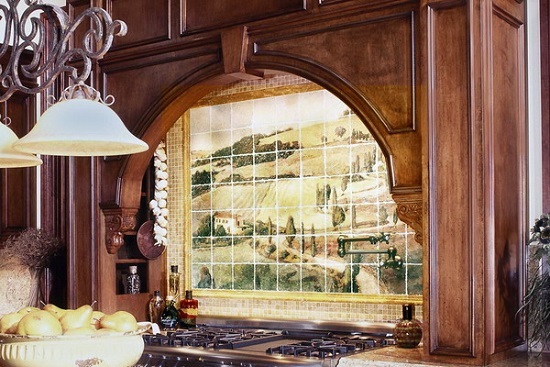 Using a painted mural for a kitchen backsplash is a superb idea. You can add a mural under the chimney and use matching tiles in rest of the area. If you’ve got a large kitchen and want to keep it simple, there’s nothing better than going in for a white backsplash. Use ceramic white tiles and cabinets while you can keep the kitchen slab made out of granite of a complementary shade. Make sure the lighting that you’re using goes with this white kitchen of yours. If you’re looking forward to give your kitchen a rustic look, go for wooden cabinets and pick grey metallic tiles for the walls. This is an amazing kitchen backsplash idea which you should definitely consider getting done if a sassy and spunky kitchen is what you’re looking for. For the fans of simplicity, beige and white are best combinations to choose while picking a backsplash design for a kitchen. 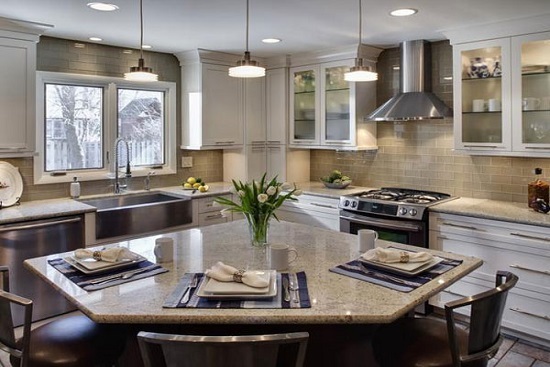 Beige ceramic tiles and white cabinets goes very well with each other in the below kitchen design. Are you crazy about colors? Why not add some to your kitchen! 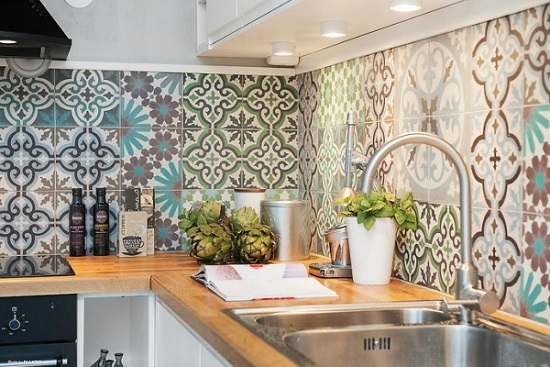 Using bright colored kitchen backsplash ceramic tiles are a great way to go. You can pick different colored tiles and put them together. 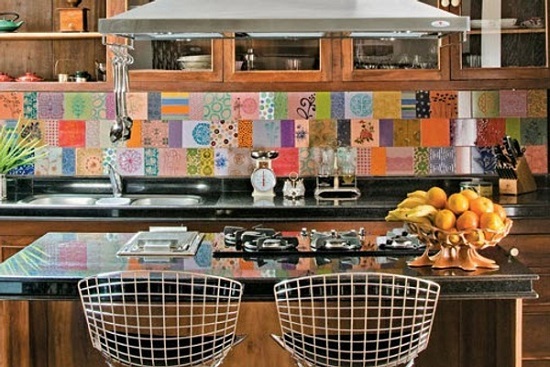 This mix and match colorful backsplash will really make your kitchen look alluring. Why cook food in a plain and boring place when you can use some of these kitchen backsplash ideas to convert the kitchen into a modish one? If you’re planning on refurbishing or designing your kitchen, make sure you don’t leave these ideas here. Keep these in your mind and make your kitchen a beautiful, stylish and comfortable place to be.